NMB Bank Ltd with its focus in Energy Sector Development is one of the pioneer banks promoting renewable energy in the country, catering best financial services to meet capital expenditure and other financial requirements of the customer. Currently the Bank has financed 32 different hydropower projects, which are in various stages and is hence contributing to the national agenda of “Ujyalo Nepal” (Lightened Nepal).The Bank has strategic intent to increase its exposure in Energy sector in future as well primarily targeting to develop hydropower projects with an installed capacity more than 10 MW. 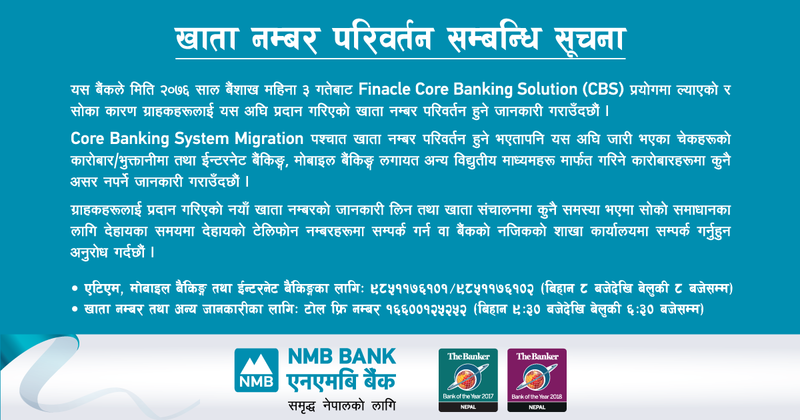 In order to facilitate the prospective customers we have drafted basic checklist of documents that the developer/customer needs to submit at the Bank (Energy Sector Department, Head Office,Babarmahal, Kathmandu). These checklist which are basically associated with the developers’ requests at various stages of the Project developments. The standard lists may not be exhaustive and hence be project specific. This shall be well notified by the Bank during the course of the financing procedure. 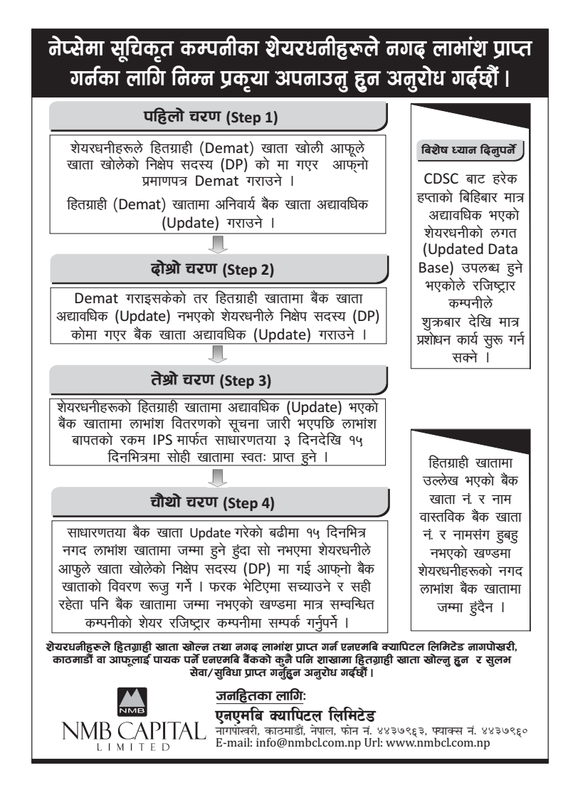 LOI is requested by the developer/customer as per the requirement of Nepal Electricity Authority (NEA) for the initial processing of; Connection Agreement and/or Power Purchase Agreement (PPA) and/or Generation License. The general validity of the LOI issued by the Bank is 1 year (from the date of issue) and the Bank shall charge standard fees (related to the size of the Project) which shall be duly notified. The decision to finance the project shall be aligned with; satisfactory project review (satisfactory outcome of Due Diligence Report), adherence to the NRB’s policies and NMB Bank’s internal policies and approval from the Bank’s competent authority. BG is requested by the developer/customer as per the requirement of NEA for the execution of PPA. NEA may claim the guarantee as per the clauses in PPA which generally cover: (NEA may include additional clauses as well). Failing to meet at least 50% progress status of the project at the Required Commercial Operation Date (RCOD) as mutually agreed by the NEA and the developer. Failing to secur the required debt arrangement (financial closure) for the project within the agreed timeline defined in the PPA. Failing to keep the project developing company functioning in order to develop the project. 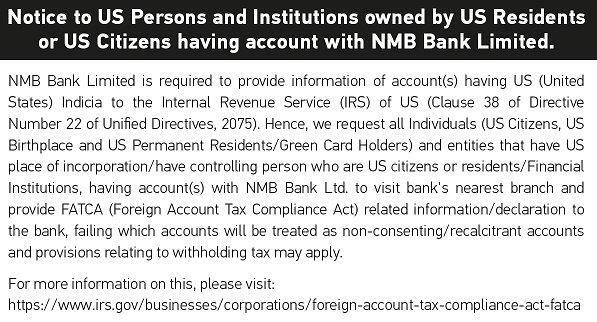 *NMB Bank shall proceed with analysis of the project with deficit documents. The proposed developer shall arrange to submit entire set of above mentioned documents before the final approval of the debt.